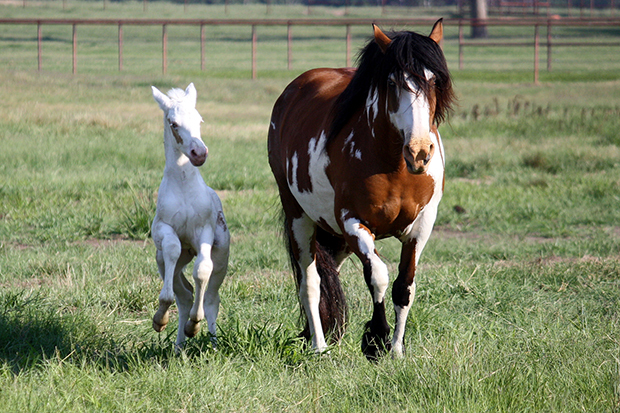 Outa Sight, a 9-year-old paint mare, walks with her first foal in this spring 2012 photo. Animal care is the chief focus of work being done on the Carr ranch, and the work done there shows up at every rodeo the Carr firms produce. DALLAS – When Clay McCallie looks around the Carr ranch near Athens, Texas, he sees the magnificence. The ranch is home to tree-lined pastures and the greatest bucking stock in professional rodeo, and it’s McCallie’s task to take care of every inch and every breathing being on the place. He takes his job quite seriously, and the proof comes every time those animals perform. The great animals from Pete Carr’s Classic Pro Rodeo will show all that off during the West Monroe ProRodeo, set for 7:30 p.m. Friday, Feb. 21, and Saturday, Feb. 22, at Ike Hamilton Expo Center. “Pete Carr wants to have a good rodeo everywhere we go, and it all starts right here on the ranch,” said Jeremy Hight, the assistant ranch manager who also serves at a pickup man at the Carr rodeos throughout the season. “Every person on our team pays attention to the animals, and they know that’s the biggest part of our job is to care for the animals. Hight was raised in east Texas and has been around livestock all his life. He has focused his attention to rodeo over the last five years. But McCallie was raised in the rodeo business with his family’s livestock firm, based in Benton, Ark. He brings that experience – as well as several years as a contestant – to his post. Most of the work for the rodeo company takes place on the ranch. Most animals will perform at less than 20 rodeos a season, so most of their time is spent on the ranch. It’s vital they receive the utmost tender loving care possible. “When you look at the stock that comes from our companies, it’s an incredible load of talent we take to every rodeo,” Hight said, referring to Carr Pro Rodeo and Pete Carr’s Classic Pro Rodeo. “I’m in a unique deal where I’m the pickup man and also work at the ranch. Pete’s done a great job of putting the right people in the right places. And the stock is the beneficiary of everything we do. The animals are pretty incredible, too; the same can be said about the people who care for them.